Migrant caravan grows to 5,000 resumes advance toward U.S.
Ciudad Hidalgo, Mexico • Despite Mexican efforts to stop them at the border, a growing throng of Central American migrants resumed their advance toward the U.S. border early Sunday in southern Mexico. 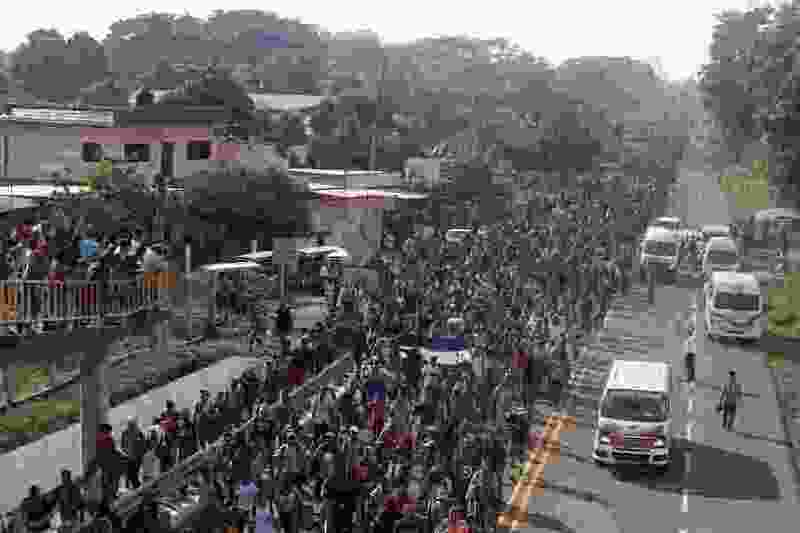 Their numbers swelled to about 5,000 overnight and at first light they set out walking toward the Mexican town of Tapachula, 10 abreast in a line stretching approximately a mile. It was not immediately clear where the additional travelers had materialized from since about 2,000 gathered on the Mexican side Saturday night. They seemed likely to be people who had been waiting on the bridge over the Suchiate River or in the Guatemalan town of Tecun Uman and who decided to cross during the night. At dawn there were still an estimated 1,500 migrants on the Guatemalan side hoping to enter legally. They marched on through Mexico like a rag tag army of the poor, shouting triumphantly slogans like "Si se pudo!" or "Yes, we could!" As they passed through Mexican villages on the outskirts of Ciudad Hidalgo, they drew applause, cheers and donations of food and clothing from Mexicans. Maria Teresa Orellana, a resident of the neighborhood of Lorenzo handed out free sandals to the migrants as they passed. "It's solidarity," she said. "They're our brothers." 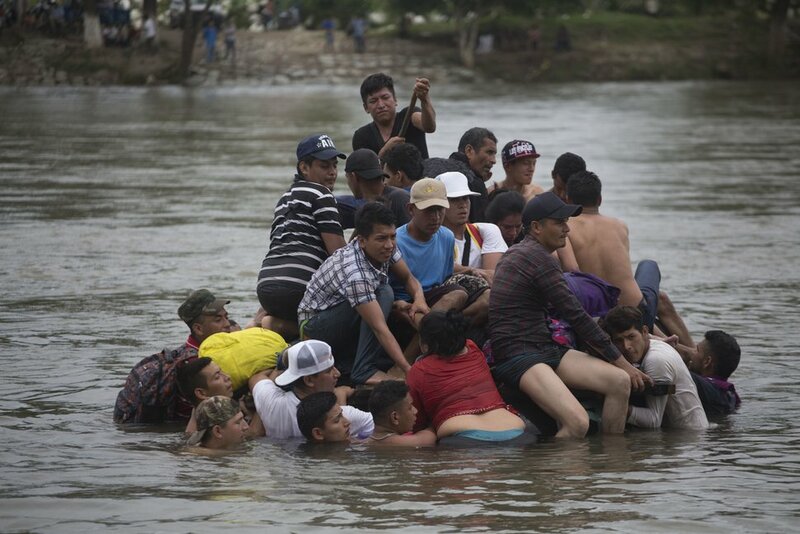 Olivin Castellanos, 58, a truck driver and mason from Villanueva, Honduras, said he took a raft across the river after Mexico blocked the bridge. "No one will stop us, only God," he said. "We knocked down the door and we continue walking." He wants to reach the U.S. to work. "I can do this," he said, pointing to the asphalt under his feet. "I've made highways." The migrants, who said they gave up trying to enter Mexico legally because the asylum application process was too slow, gathered Saturday at a park in the border city of Ciudad Hidalgo. They voted by a show of hands to continue north en masse, then marched to the bridge crossing the Suchiate River and urged those still on it to come join them. The decision to re-form the migrant caravan capped a day in which Mexican authorities again refused mass entry to migrants on the bridge, instead accepting small groups for asylum processing and giving out 45-day visitor permits to some. Authorities handed out numbers for people to be processed in a strategy seen before at U.S. border posts when dealing with large numbers of migrants. 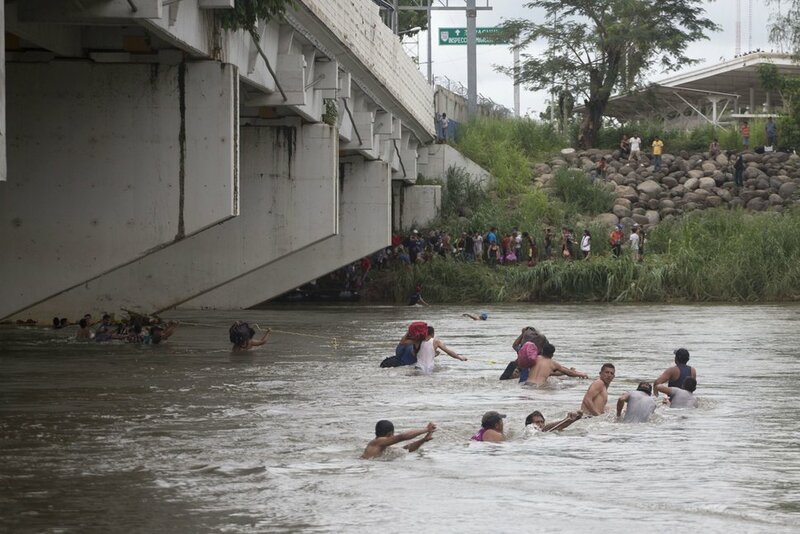 But many became impatient and circumventing the border gate, crossing the river on rafts, by swimming or by wading in full view of the hundreds of Mexican police manning the blockade on the bridge. Some paid locals the equivalent of $1.25 to ferry them across the muddy waters. They were not detained on reaching the Mexican bank. Sairy Bueso, a 24-year old Honduran mother of two, was another migrant who abandoned the bridge and crossed into Mexico via the river. She clutched her 2-year-old daughter Dayani, who had recently had a heart operation, as she got off a raft. "The girl suffered greatly because of all the people crowded" on the bridge, Bueso said. "There are risks that we must take for the good of our children." In addition to those who crossed the river, immigration agents processed migrants in small groups and then bused them to an open-air, metal-roof fairground in Tapachula, where the Red Cross set up small blue tents on the concrete floor. Mexico's Interior Department said it had received 640 refugee requests by Hondurans at the border crossing. It released photos of migrants getting off buses at a shelter and receiving food and medical attention. At least half a dozen migrants fainted in the crush. Some tore open a fence on the Guatemala side of the bridge and threw two young children, perhaps age 6 or 7, and their mother into the muddy waters about 40 feet below. They were rafted to safety in on the Mexican bank. 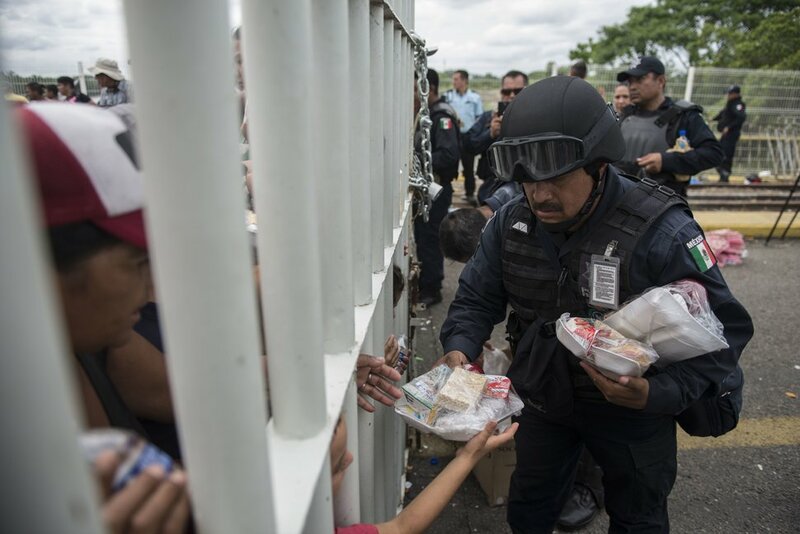 Mexican workers handed food and bottled water to the migrants on the bridge. Through the bars, a doctor gave medical attention to a woman who feared her young son was running a fever. Sustenance also came from Guatemalan locals — for Carlos Martinez, a 24-year-old from Santa Barbara, Honduras, the plate of chicken with rice was the first bite to eat he'd had all day. "It is a blessing that they have given us food," Martinez said. "It gives me courage to keep waiting, as long as I can." Migrants cited widespread poverty and gang violence in Honduras, one of the world's deadliest nations by homicide rate, as their reasons for joining the caravan. Juan Carlos Mercado, 20, from Santa Barbara, Honduras, says corruption and a lack of jobs in Honduras has stymied him. "We just want to move ahead with our lives," he said Sunday. He said he'd do any kind of work. The caravan elicited a series of angry tweets and warnings from Trump early in the week, but Mexico's initial handling of the migrants at its southern border seemed to have satisfied him more recently. "So as of this moment, I thank Mexico," Trump said Friday at an event in Scottsdale, Arizona. "I hope they continue. But as of this moment, I thank Mexico. If that doesn't work out, we're calling up the military — not the Guard." "They're not coming into this country," Trump added. "The Mexican Government is fully engaged in finding a solution that encourages safe, secure, and orderly migration," State Department Spokeswoman Heather Nauert said Saturday, "and both the United States and Mexico continue to work with Central American governments to address the economic, security, and governance drivers of illegal immigration." After an emergency meeting in Guatemala, presidents Hernandez of Honduras and Jimmy Morales of Guatemala said an estimated 5,400 migrants had entered Guatemala since the caravan was announced a week ago, and about 2,000 Hondurans have returned voluntarily. Morales said a Honduran migrant died in the town of Villa Nueva, 20 miles (30 kilometers) from Guatemala City, when he fell from a truck.